Free shipping in the US till June 30. Use code FREESHIP. – USA: $15 flat rate via USPS or use your own shipper account. – International: $120 or use your own shipping account. The sqt-1 plasmid encodes for a cuticle collagen expression in C elegans. Composition is sqt-1p::SQT-1(genomic)::sqt-1utr. A single point mutation (e1350) within the gene produces a morphological phenotype similar to Rol due to an improper cuticle formation. Expression of SQT-1 is seen during L2, L3, and L4 larvae and adult stages, but not L1 or dauer larvae. View the Plasmid Map. The HygR plasmid encodes for hygromycin resistance, a useful selection tool, resulting in broad expression of hygromycin B phosphotransferase (HPT) in C. elegans tissues. The HygR plasmid is commonly added into an injection mix at a final concentration of 10 ng/uL in a 100 ng/uL total DNA mix. Sufficient accumulation of HPT expression occurs 24 hours post injection and survival starting two days post Hygromycin B exposure (0.25 mg/mL) indicates resistance. By day five of post hygromycin exposure, only resistant animals are present. View the Plasmid Map. The “Super-rol” plasmid is an optimized version of a popular co-injection marker that encodes a mutant collagen that induces a dominant "roller" phenotype. This easy to detect phenotype is compatible with many co-injected transgenes. The “Super-rol” plasmid is commonly added to an injection mix at a final concentration of 40 ng/uL. View the Plasmid Map. sqt-1 marker plasmid (pNU1228): this plasmid is suggested as a co-marker of injection efficiency in C. elegans and other nematodes. Successful injections will display a Rol phenotype in L2-L4 larvae and adult worms. In the injection mix, a final concentration is commonly used at 10 ng/ul in a 100ng/ul total DNA. The reagent is supplied as a 10X stock. 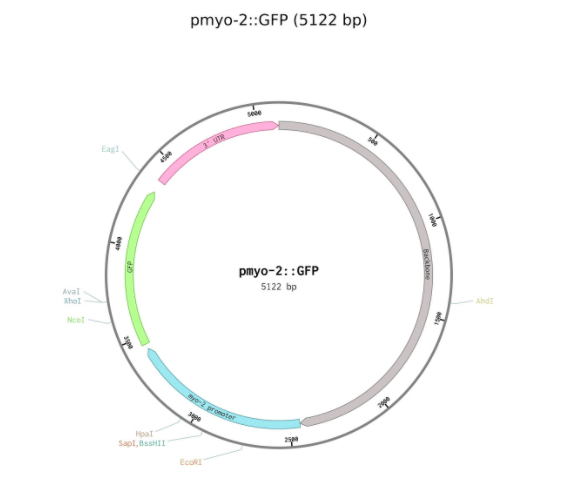 myo-2::GFP marker plasmid (pNU675): this plasmid can be used as as a co-marker of injection efficiency in C. elegans or other similar nematodes. Successful injections will display a bright green pharynx. In the injection mix, a final concentration of 1.5 ng/ul is commonly used in a 100ng/ul total DNA. The reagent is supplied as a 10X stock. 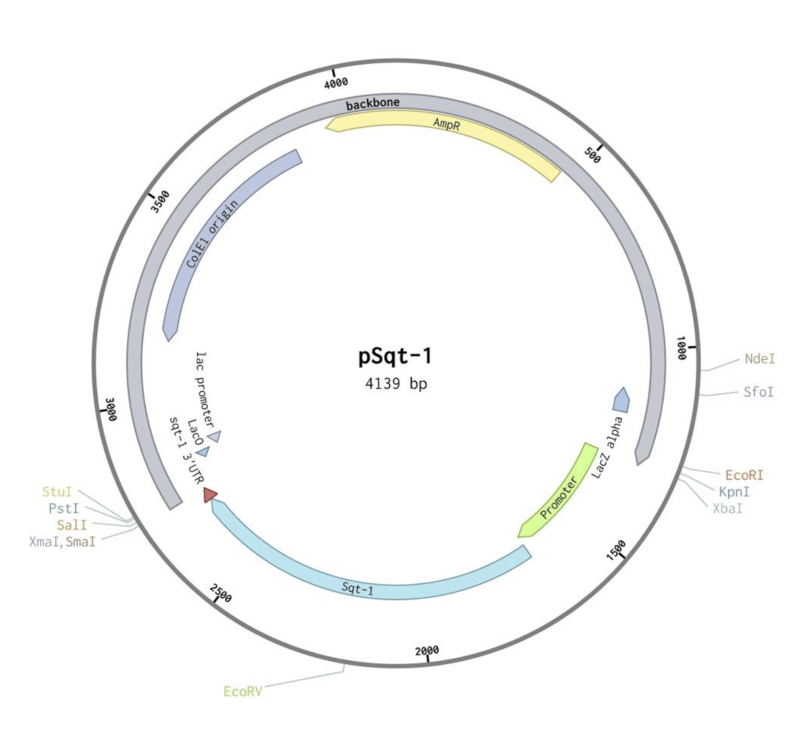 hygR selection plasmid (pNU1254): this HygR plasmid is a good selection tool for use in C. elegans or other similar nematodes. Successful injections will be resistant to Hygromycin B (0.25mg/ml) in plates. Addition of HygR plasmid into an injection mix is commonly used at a final concentration of 10 ng/ul in a 100ng/ul total DNA. The reagent is supplied as a 10X stock.